Yesterday in my Teaching Composition class, my colleague Antero Garcia and I had a conversation, as two experienced teachers, to discuss issues related to privilege, positionality, and culturally responsive teaching. 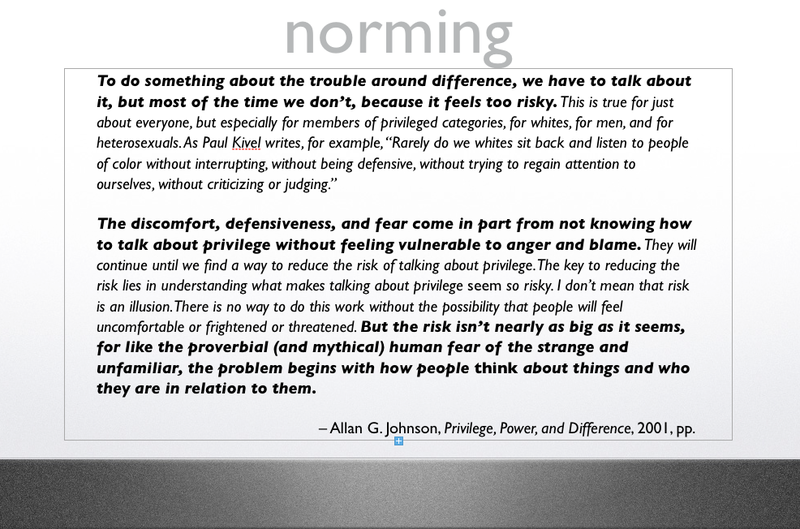 I shared an excerpt from Allan Johnson’s book Power, Privilege, and Difference about the riskiness inherent in discussing issues of privilege (that’s the slide above). Allan acknowledges the tensions and defensiveness that these conversations can provoke while at same time asserting that they need to happen. Although Johnson’s book isn’t aimed directly at preservice teachers, Antero and I agree with him that the conversation is also a necessary precursor to students’ involvement in a service-learning project we’re asking our students to complete this semester. The Saving Our Stories (SOS) Project will require our preservice teachers to create culturally responsive curriculum that will allow students to capture the stories of Latinos in Fort Collins. This population has been historically marginalized in our city, so the impulse isn’t something we pulled out of thin air. Antero’s students will focus on creating reading curriculum, and mine will focus on writing curriculum. We’re defining text broadly in the project to include digital and multimodal texts. Our students will pilot their curriculum at a nearby alternative high school with the intent that it will be adapted for use this summer in a digital storytelling summer school class for ELLs at a high-needs school. We decided that it was important to frame the SOS Project theoretically with a problem we also know exists–the very real challenge that the majority population of teachers–white, middle-class—face in acknowledging that their increasingly diverse students’ culture (even in Colorado) may not map neatly on their own. So here’s how we did it. We wrote to unpack the language around the terms privilege, positionality, and culturally responsive teaching. Antero and I, in the role of experienced teachers, had a conversation about our own discomfort and uncertainty in dealing with these thorny issues in our own teaching. We wrote some more to process and prepare for discussion. We drew on all of the above to inform our class discussion. I’m still processing the discussion (you can listen to it here), but I do believe it was honest and brave, and I’m eager to hear how it unfolds in the rest of the semester. A few snippets: During norming, one student expressed her desire to really know what others thought about these issues. During discussion, some students admitted frustration with the reading, and another posed the beautiful question, “What’s at stake for our students?” Several students said nothing at all. How it all went remains to be seen, but I took it as a positive sign that students wanted to know about next steps and solutions. What I’m doing next: In tomorrow’s class, I want to see what their thoughts are since last class. I want to share some solutions that Johnson suggests in a later chapter that they didn’t read, “What Can We Do? : Becoming Part of the Solution.” I want to hear what the students in Antero’s class are talking about today (since we share about half of our students). And I want to tackle the question of what’s at stake in light of their new reading assignment, “Warm Demanders” from Lisa Delpit’s new book Multiplication is for White People. How I’m feeling now: I’m working from the assumption that my students want to do right by their future students. I’m a little worried that Antero and I, by taking the bull by the horns this early in the semester, may be accused of pushing our own agendas. (Are we? Is it possible not to do that a teachers? Don’t we do that every day in safer pedagogical territory?) And I’m determined to move beyond steeping in frustration to learn together with my students, in practical terms, about why this hard work is so necessary. I’ll try to keep you posted on the results.